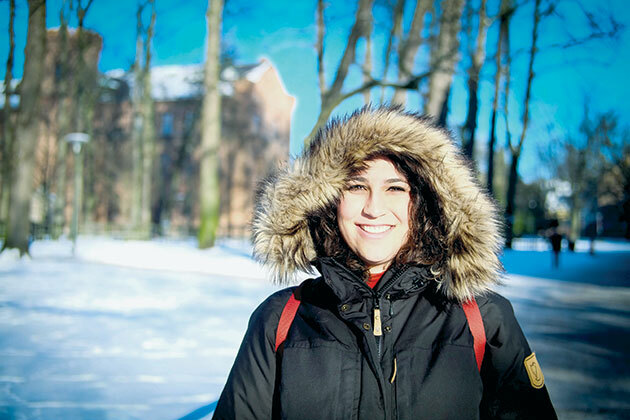 I am Renee Gonzalez, a 2014 Rice grad currently working on my master’s in applied cultural analysis (MACA) at Lund University in southern Sweden. What is applied cultural analysis? Think ethnographic/anthropologic consulting for businesses and organizations. I was initially drawn to the MACA program because of its partnership between Lund University in Sweden and the University of Copenhagen in Denmark, which means I have classes in both Lund and Copenhagen (less than an hour away from each other by train). The diversity of the classroom setting is reflected in the teaching staff and, especially, the students. In fact, my 16 classmates represent 11 countries. The value of diverse learning environments was something I discovered as an undergrad at Rice — through study abroad trips to Cuba and Costa Rica — and it motivated me to seek a European educational experience. Although the Swedish education system is structured much differently than in the U.S., I find Lund University to be similar to Rice in many ways. Here in Lund, we have the nations system, which works like a relaxed version of the residential college system. The nations even have their own version of Beer Bike called Tandem, during which team members take turns riding a tandem bike roughly 163 miles from Gothenburg to Lund. Outside the university, however, Lund and Houston could not be more different. Founded around 990, Lund is a relatively small town with a population of 83,000, half of whom are students, in the southernmost province of Sweden, called Skåne (sk-OH-nah). Historically, Skåne belonged to Denmark, and it retains a strong Danish-Swedish connection because of the Öresund Bridge, which links Copenhagen and Malmö. Lund prides itself on preserving its historical landscape, so old cobblestone roads remain in the city center, and the famous Lund Cathedral acts as the city’s North Star. While the adjustment from a big driving city like Houston to a small biking city like Lund has been challenging at times, it’s impossible not to get caught up in Lund’s small-town charm, which serves as a nice reminder of the invaluable opportunity I have to be educated in Sweden, both in academia and life.